Greek Yogurt Chicken Salad with grapes is life changing. 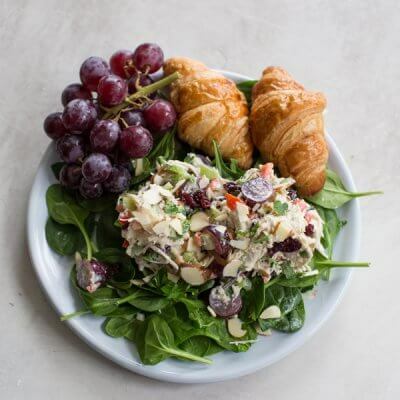 Make this easy chicken salad recipe made with grapes, cranberries, and almonds for healthy lunch meal prep. In large bowl, mix together chicken, yogurt, mayo (if using), honey, salt and pepper. Stir until chicken is fully incorporated into the yogurt. Stir in almonds, cranberries, celery and bell pepper until fully mixed. Fold in grapes and parsley. Serve on a bed of salad greens or stuffed in fresh croissants. Nutrition info calculated with 1 tablespoon honey; does not include salad greens of croissant.